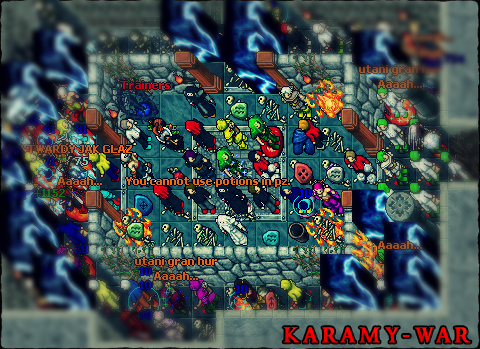 On February 8 at 19:00 Polish time Karamy-War under protocol 8.6 will begin! 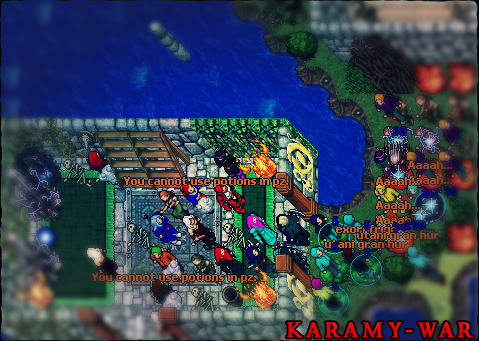 Karama's server has one of the best OTS server balance, the mass of guilds have made significant contributions to creating it for years! 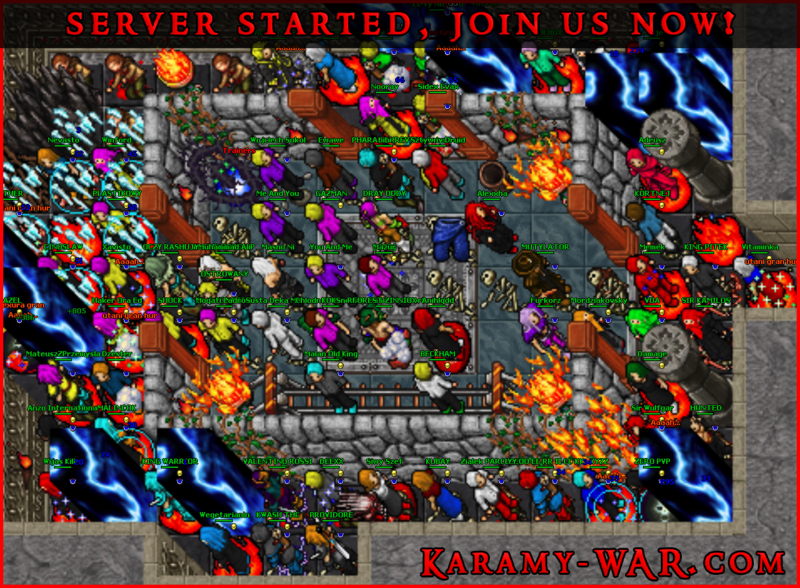 On our server there is a block of area spells on ED and MS above 15 people on the screen and increased exhausted on the wave. On the upcoming edition you will have five cities to choose, and an additional open desert for guilds that will want to be measured individually -!T open. Karamy is hosted in one of the best hosting companies in Europe, OVH. 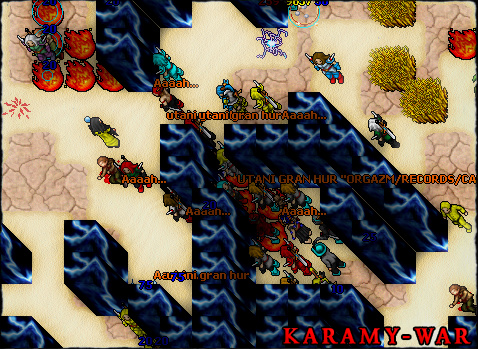 Parameters of our server guarantee lag-free game, we can host up to 1000 players without any troubles. Most of the attacks are blocked by our protection system, if someone is able to break the protection wall then it must be a real professional but the damage that he would cause would be fixed straight away. Our website is ahead of the competition. We are using a style created on a special request, we don't use layouts that can be found on the internet. We have many rankings for you: countries ranking, daily number of frags, weekly, monthly, for all the time and number of deaths daily, weekly, monthly and for all the time. There are also guild rankings and special rankings (contests). Our system of gaining experience is created so that reaching maximum level would take some time. System has been designed to take into account free frags and activity of victims - for killing player who just went out from pz you get much less experience than for player who is getting frags for some amount of time. To quickly assess player's skills you just have to look at his level and skull. The skull depends on the number of frags that will change. For every frag player receive 1 crystal coin and 1 soul orb. For 100 soul orbs you can get 30 premium points (exchange from Djinn). For earned crystal coins you can get addons (150cc) and promotion (300cc) which make that in case of yours death you lose two times less experience. We offer you original war system which allows you to settle which guild is better. But that isn't all, our author's system in heavy wars will offer additional experience points for participating in wars. Additionally, despite of this, we will be doing statistics guild vs guild without war system. Moreover on server you will find overwhelming number of functions which are not offered by competitors but really improves the game. With us it is simply a basis. To this things we can include pass through each other players in pz, working commands to change outfits, emoted spells, number of frags by clicking look and other functions.